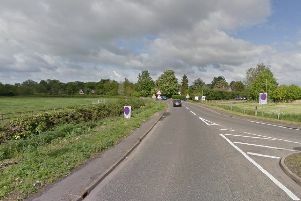 A motorbike rider from Bourne has died after colliding with a van. Steven Bristow, 42, of Chuch Walk, was pronounced dead at the scene after the crash on the A15, near Waterside Garden Centre outside Baston, at about 1.15pm yesterday (Monday, October 19). Police have appealed for witnesses to the crash. Senior investigating officer sergeant Ewan Gell said he was keen in particular to talk to anyone who saw a black Yamaha motorbike overtaking vehicles on the A15 travelling north towards Bourne at the time of the accident. The bike collided with a white Mercedes Benz van travelling towards Market Deeping. “I would appeal to anyone who was travelling along the A15 at Baston and who was overtaken by a motorbike, or who saw either vehicle, or the crash to give the investigation team a call” said sergeant Gell. Call the Collision Witness Hotline on 01522 558855, quoting incident 192 of October 19.